On these pages are listed supplies provided by Phoenix Obsidian Designs which might potentially be needed by a flintknapper in the pursuit of his/her craft. Below are some of the tools necessary for Percussion Reduction work (Definition). This stage of Flintknapping produces Percussion Blades or the flakes or blanks to be Pressure Flaked into a final form. 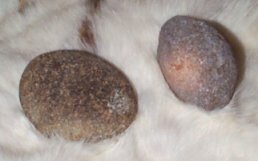 These stones are the right shape and size for use in percussion flintknapping work. These stones come in a variety of weights which are useful for different purposes and types of flintknapping materials. Specific water-worn rock types range here from basalt, andesite, to sandstone. No specific size, rock type, or weight is guaranteed. Dr. Arizona uses these for all stages of percussion work with Obsidian. If you are first building your tool kit, it is suggested to get the five hammerstone sampler which has a wide selection of weights. If you are working harder materials, such as chert, you might want to use Hard Hammerstones instead. 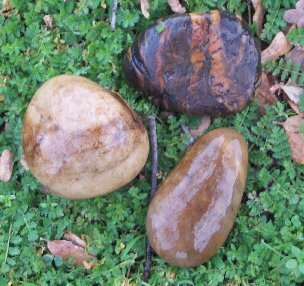 These stones are the right shape and size for use in percussion flintknapping work. These stones come in a variety of weights which are useful for different purposes and types of flintknapping materials. Specific water-worn rock types range here from quartzite to diorite. No specific size, rock type, or weight is guaranteed. Dr. Arizona does not use these as often. If you are first building your tool kit, it is suggested to get the five hammerstone sampler which has a wide selection of weights. If you are working softer materials, such as obsidian, you might want to use Soft Hammerstones instead. 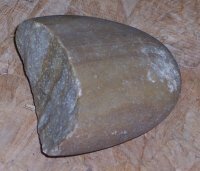 This hammerstone is intended for use during groundstone manufacturing and maintenance. It is generally a quartzite or other hard cobble with several initial flakes struck off to create a wedge shaped edge. Further flakes should be struck off to maintain this edge during use. These billets (aka. 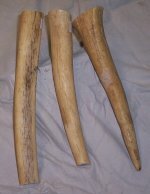 boppers) are solid elk or deer antler pieces of various weights. 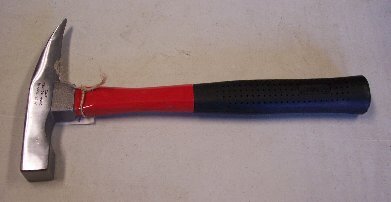 Can be used for detailed soft hammer percussion work. These are of a length and size useful for use by the controlled swinging of the hand. The ends are left unfinished (rough cut) so that you can shape them as desired by grinding. 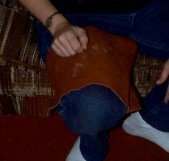 A large piece of leather (approximately 1 foot by 1 1/2 foot) useful for both pressure and percussion flaking. When lain across the legs, it helps protect the legs from the flakes and blows of percussion work. If held double in the hand, it both protects and pads the palm. Available in Cow, Elk, Split Bison Hide and economical Denim. The Half Size Lap Shield (approximately 6 inches by 9 inches) is good for one leg, is easy to store and works best as an alternative Palm Guard. This 22 ounce rock pick is of one-piece forged construction and has a pointed tip. For shock reduction it has a specially designed Nylon vinyl grip. This tool is an excellent option for groundstone manufacture.